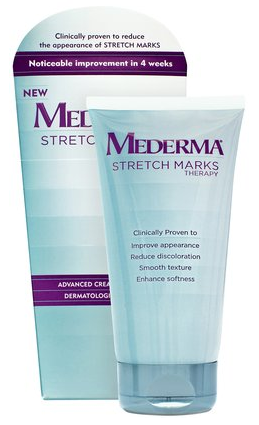 Mederma® Stretch Marks Therapy is an advanced cream formula that combines a unique blend of ingredients: Cepalin®, Hyaluronic Acid and Centella Asiatica. In a recent clinical study, 80% of participants reported visible improvement in the overall appearance of their stretch marks after using Mederma® Stretch Marks Therapy for 12 weeks. That’s 8 out of 10 women. And that’s reason to try yet another stretch marks therapy. After years of buying self proclaimed miracle lotions & potions, and slathering myself in so much cocoa butter I could have taken stock (and should have ;), I had just about given up the fight and was ready to settle for the fact that I just may have to live with my "battle scars" forever...........and then I came across the all new Mederma Stretch Marks Therapy while browsing online recently! We have used Mederma Scar Therapy in our home before, and were very pleased with the results so I was excited to have the opportunity to review their all new therapy specifically designed to reduce the appearance of these unsightly marks! It's recommended that you use the treatment for a full 12 weeks so I was sent three tubes for review (each tube contains a 30 day supply). After applying the lotion to my problem areas for 2 weeks, I began to notice that the marks were much lighter, now after 5 full weeks of use, the marks are not only lighter, they are smoother and barely noticeable! I am eager to see the results after the fully recommended time period of 12 weeks! I have felt self conscious in the past about these marks, now I feel much more comfortable in my own skin. I HIGHLY RECOMMEND Mederma Stretch Marks Therapy! BUY IT: You can find additional information about Mederma Stretch Marks Therapy at http://www.mederma.com/ Mederma can be found at a retailer near you. Experience Mederma Stretch Marks Therapy for yourself! One Lucky Reader will receive a 12 Week ( 3 Tubes ) supply of Mederma Stretch Marks Therapy! Leave a comment~ Why are you excited to try Mederma Stretch Marks Therapy? The comment is considered your entry. I would love to try it to see if it works on older women's stretch marks, not just the younger women. Please enter me. I would love to get rid of these ugly stretch marks. That makes me very excited. After 4 pregnancies my whole body is overcome with stretch marks. I've tried everything and nothing has worked. I've been dying to try this but since I'm recently unemployed I haven't been able to yet so I'd LOVE to win this !! With my first pregnancy I was alone without friends and family in a place where I wasn't sure about anyone or anything so I did not take care of my body or myself and ended up gaining more weight than I should have. The stretchmarks covered my body everywhere and with each pregnancy afterwards got a bit worst.I would love to be able to use Mederma to help me feel more confident and comfortable with myself by helping me lessen/get rid of my stretch marks. Entered the Childrens Place giveaway. I'm 21, have 2 kids and another on the way. Please help me fix my body! I'm a follower. I'm excited to try this because I hate looking in the mirror and seeing stretch marks and I haven't found anything yet that really works! I'm excited to try this b/c I am nearly 7 months pregnant and tried other things that haven't worked. I am very excited to try Mederma Stretch Marks Therapy because after having 4 kids, I too have the battle mark scars of motherhood. It would be nice to get rid of them so yes i am dying to try it out! After a set of twins and a singleton... my stomach could use some "help". I would love to try the Mederma stretch cream!! After 6 kids including twins I could sure use it. I'm excited to try this, because I've wanted to ever since seeing the commercials! My first pregnancy was rough as far as stretch marks, and I'd love to look better! i entered the ipod nano giveaway as well! AHHH!!!! I WOULD LOVE TO WIN THIS! I tell my husband everytime I see the commercial that I need this! haha! Well, the answer is very simple: I must admit I have stretch marks and wish to smooth them down or even get rid of them. Thanks! I follow you with GFC (CatalinaK). I follow you on Twitter (@CKhalaj) - second comment. i'm excited because I've had 5 children LOL!